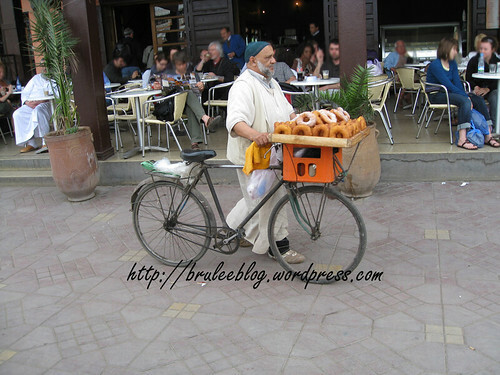 My last post on Marrakech. But more Morocco to come! 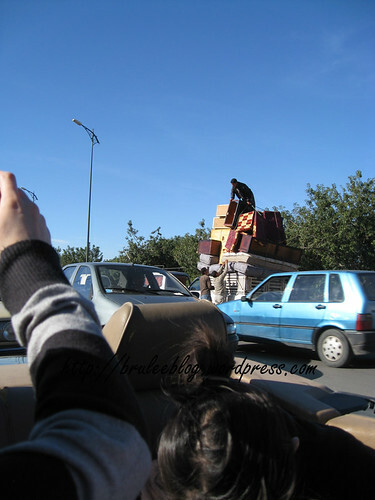 A man was selling mint from giant sack, right on the street. Fried fish. Mark, our guide, said that it wasn’t worth eating seafood here and that it would be better on the coast. Also, notice the Activia sign. I had no idea that stuff was so far reaching! Lots and lots and lots of colourful tagines for sale. 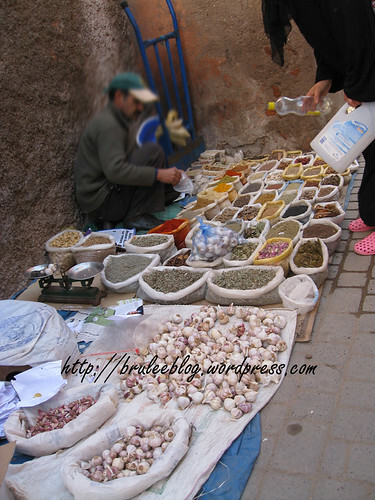 Garlic and spices for sale on the side of the street. 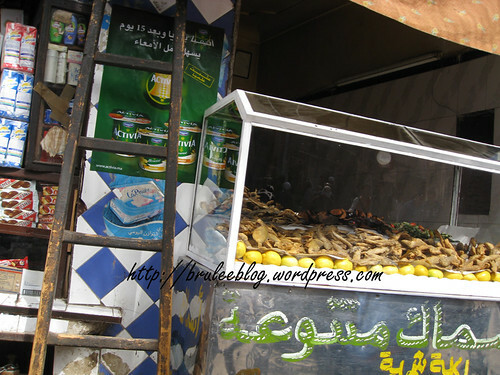 Sheep’s head, anise flavoured snails and cinnamon are three things that immediately flood my memory when I think about Djemaa el Fna and Marrakech. 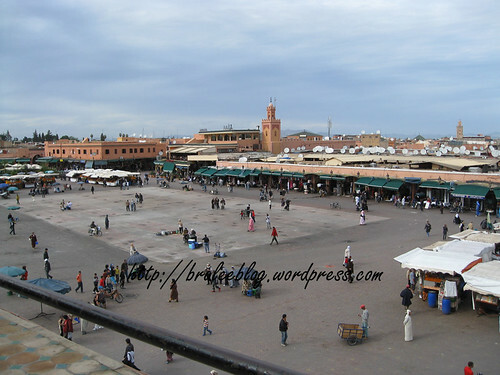 Djemaa el Fna is the main square in Marrakech’s medina quarter. Bustling and filled with merchants and performers all day and night, this area inspired the Masterpieces of the Oral and Intangible Heritage of Humanity UNESCO project, where they identify cultural history such as music and performances, rather than physical buildings and places. 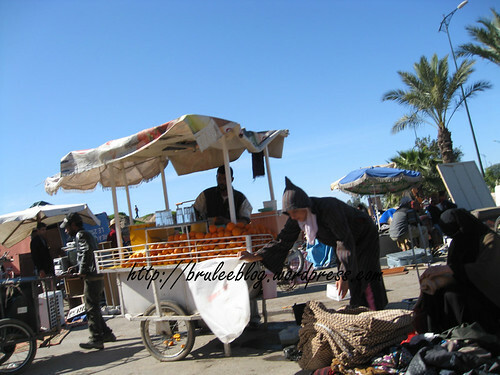 During the day, stalls sell orange juice, dates and nuts. 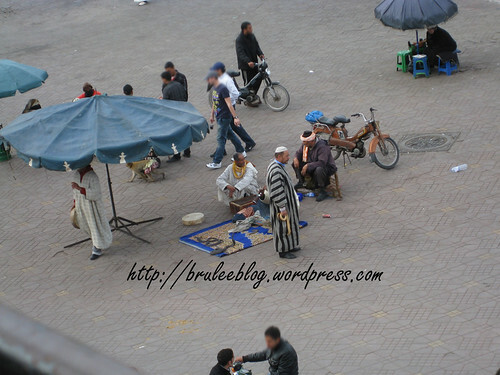 Performers wander around with poor Barbary apes on chains and snake charmers try to lure in tourists. There are a number of cafés facing the square. And then, before sunset, the snakes move out and the food carts start moving in. 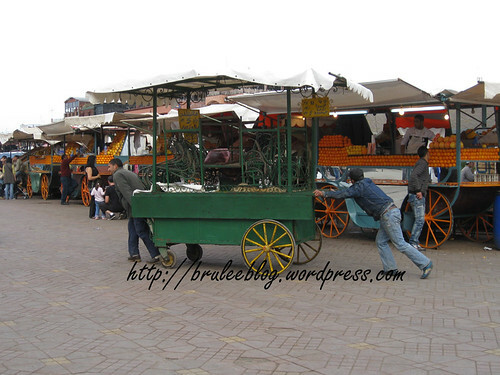 To me, this is when Djemaa el Fna really comes alive. 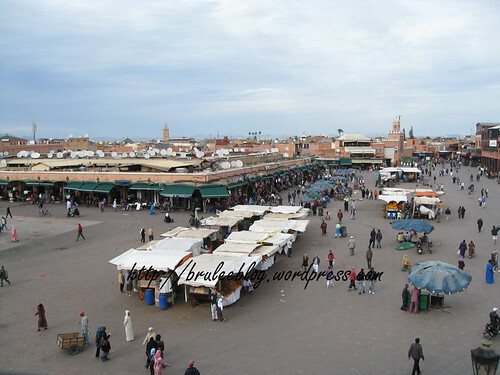 At night the square is filled with food stalls, hungry people, singers, drummers, dancers, storytellers, women doing tattoos with some dubious henna and people selling traditional medicines. 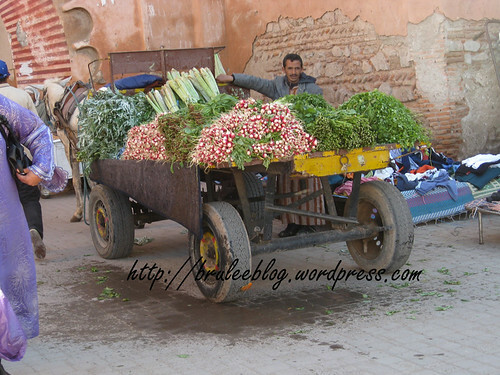 While we were in Marrakech, we went to a local souk. 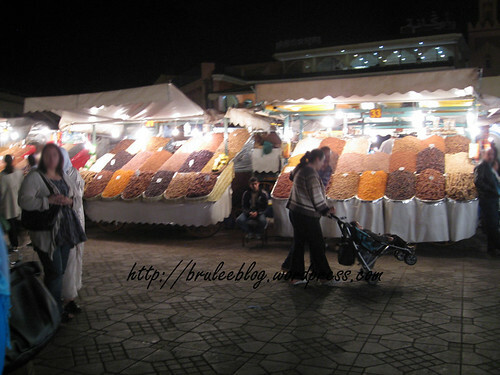 Souks are markets – sometimes permanent and sometimes weekly, depending on the souk. 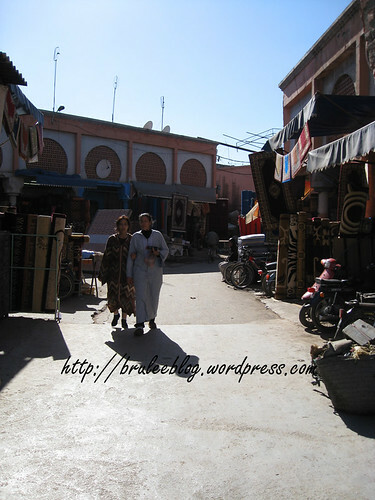 This souk wasn’t a tourist one where you could buy souvenir trinkets, but a souk that locals went to for various needs. Part of the souk is permanent and sells things like furniture. 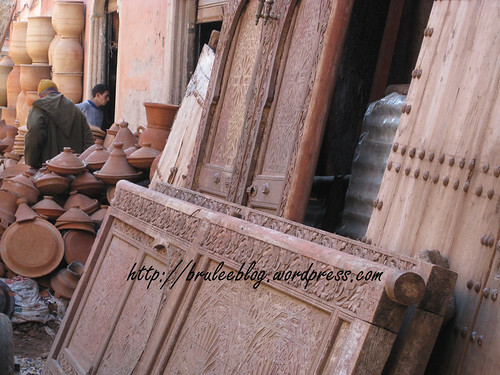 The other part of the souk was transient and reminded me of a flea market. You could buy anything including shoes, carpets, clothing… I even saw an old VCR player for sale! Some of these photos are a little crooked because I was taking them with my camera hidden partially under a jacket draped over my arm. 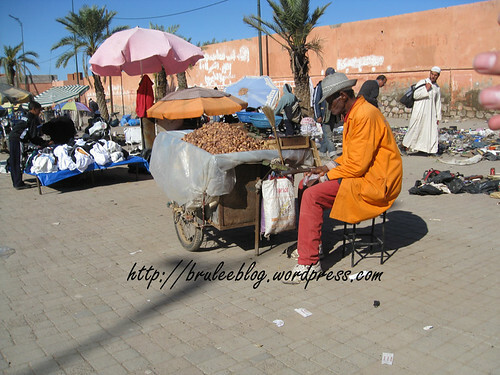 Taking photos in Morocco isn’t always easy as people tend to prefer not to have their photo taken, so unless we had specific permission from someone to take their photo I tended to take unobtrusive pictures instead. 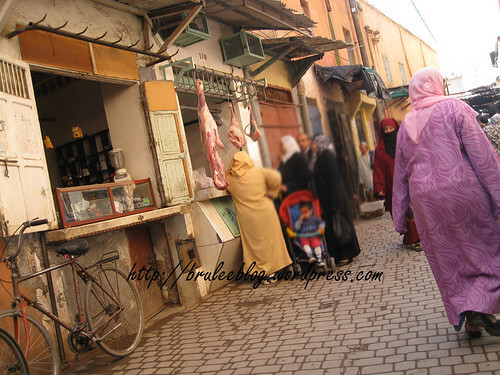 I could have straightened the photos on my computer, but I feel like the angles are part of my Moroccan experience and decided to leave them all in instead! I cannot stop marvelling at the oranges in Morocco. I still dream of their sweet goodness. 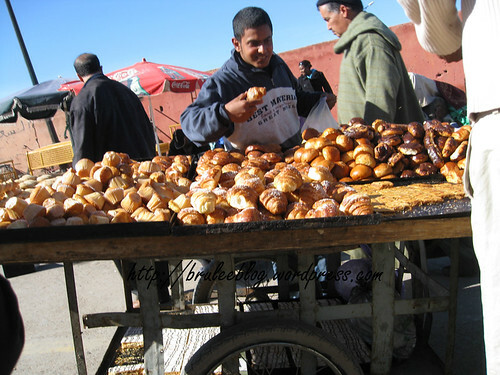 Moroccans love sweets and pastries. I think these were chestnuts but I can’t remember for sure. I saw so many tagines during the trip and I dearly wanted to buy one but there was no way I would be able to haul one around for the rest of our trip and I was afraid that it wouldn’t survive a trip through the post office. They were so cheap, and they were all so very tempting. The locals must have thought I was nuts for taking some of these photos. 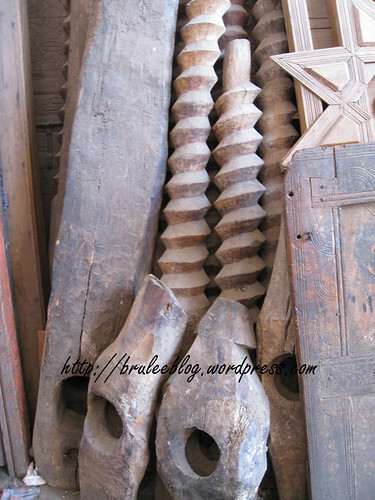 These are parts of an olive oil press. Some of the spiral posts were taller than I am! How did people got all this stuff home? By cart or truck, if necessary. Goodbye London! 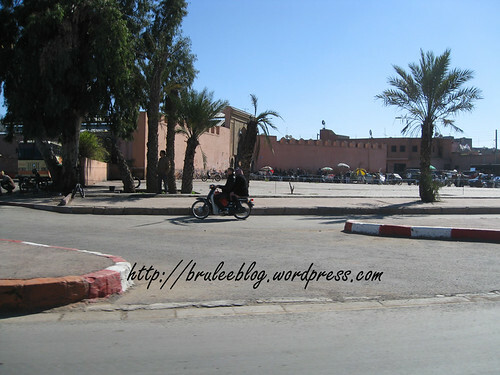 After a cramped flight on a discount airline, we landed in Marrakech, Morocco. Our guide, Mark from Mad About Morocco, arranged for a driver to pick us up and deliver us to our first stop where we would spend the next two nights, the Riad Elizabeth. 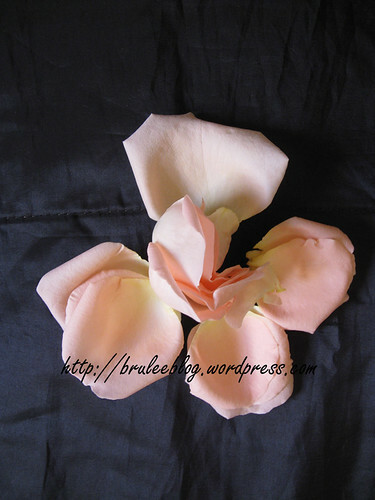 Before I go on I should explain a couple of terms that you will see me use quite often in my Moroccan posts. 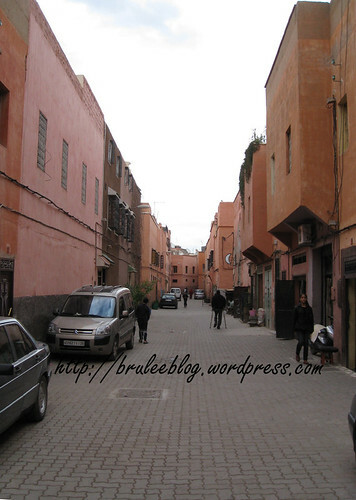 A medina is a section in North African cities that is sometimes referred to as “old town.” It is the oldest or older part of the city, and was built by the Arabs as a walled town with many narrow streets. The streets are so narrow that some, if not all, streets must be accessed on foot and by donkey. Cars usually cannot access these streets, and in some cases they also can be too narrow for carts, bicycles and motorcycles (not that this stops anyone from roaring their motorcycle down a narrow medina street). Medinas often are like mazes, with many twists and turns, and contain many places of historical interest like palaces, mosques and fountains. They usually have multiple gates, and sectioned off quarters. 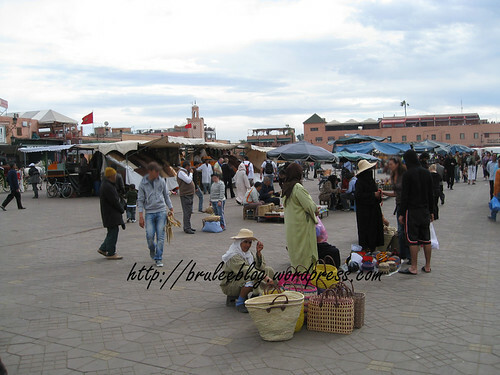 This is where all the tourists want to go, and where many Moroccans want to move out of, as the newer sections of the city are more modern and middle-class. 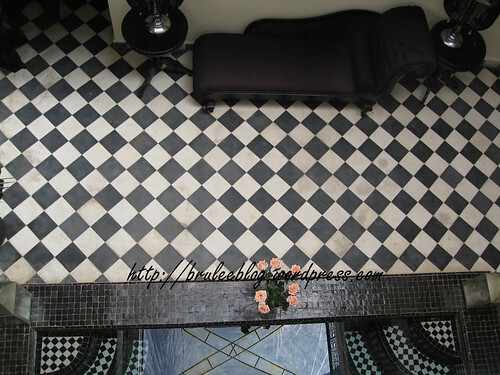 A riad is a traditional Moroccan home that has a central open-air courtyard and/or garden in the middle. The rooms of the house surround the courtyard, which is traditionally open to the outdoors, although many modern renovations now have retractable roofing to cover the opening. Many renovated riads now serve as hotels and restaurants. 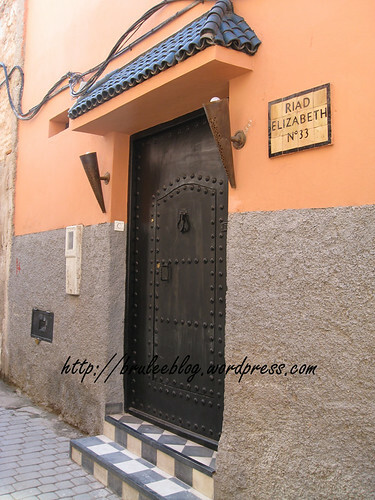 Located in Marrakech’s medina, the Riad Elizabeth is unique in that it is relatively easily accessible by car (although you still have to walk for a minute or so). One of the owners, an ex-pat Brit named John, greeted us and immediately sat us down for some lovely homemade cookies and mint tea. 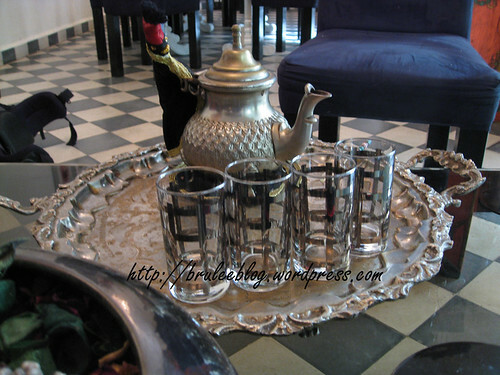 Hospitality is a very important part of Moroccan life; as soon as you enter someone’s home you are offered mint tea and some sort of snack. 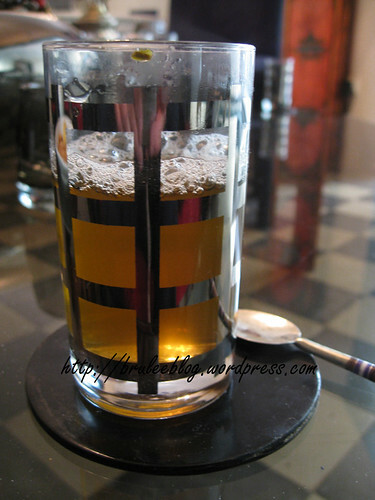 Mint tea is a traditional drink in Morocco, and it is served in small glasses. 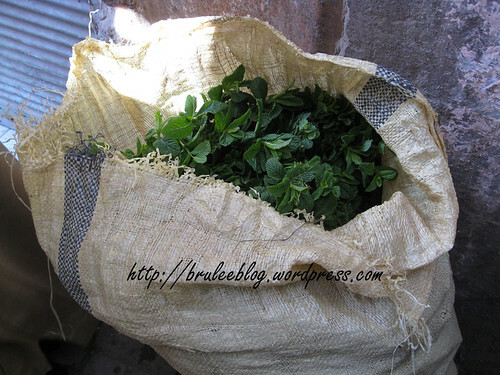 It is made by brewing green tea (sometimes jasmine or gunpowder) and adding large amounts of fresh mint. And lots and lots of sugar. 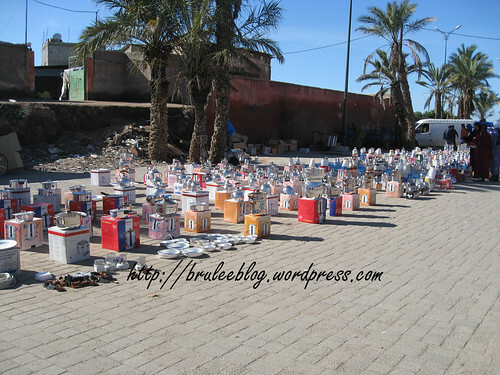 Moroccans love adding copious amounts of sugar into their tea. In my small cup I added one sugar cube and it was plenty for me. John told us that Moroccans would probably have added 4 or more cubes of sugar. 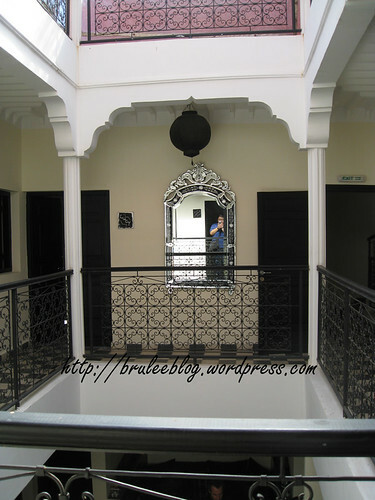 The entire riad has been renovated, which made for a nice, easy transition into the culture and atmosphere of Morocco. Wait, who's that in the mirror? 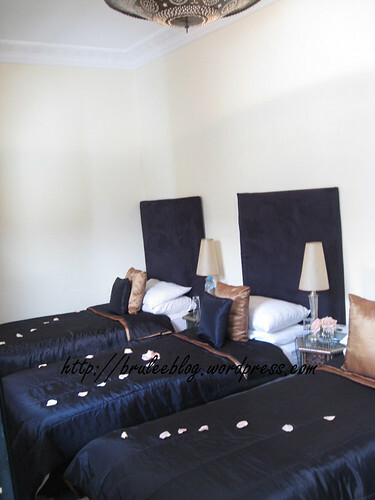 This riad can arrange for dinner, or can help you with taxis to restaurants. 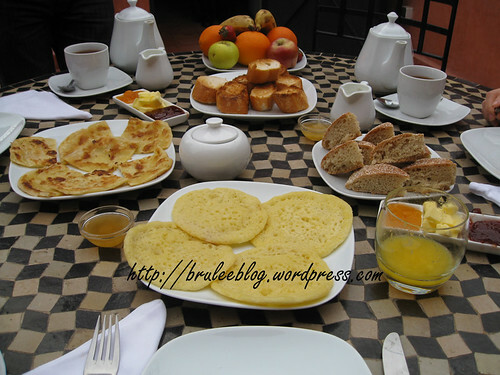 Every room comes complete with a full breakfast, served on the riad’s rooftop patio. 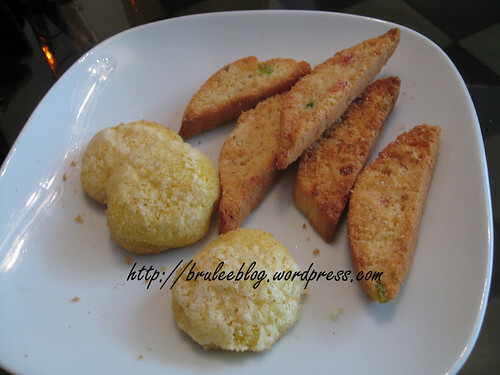 Clockwise, starting at 12 o’clock, are toasted baguettes, Moroccan bread (named khobz and pronounced hobs in Arabic), fluffy Moroccan pancakes (named beghrir in Arabic), and thin Moroccan crepes (named msemen in Arabic). The crepes reminded me of Malaysian roti. The jam was delicious, and the orange juice was freshly squeezed and sweet. Oh and the oranges! I fell in love with Morocco’s oranges. Almost every orange I ate during the trip was sweeter and tastier than any orange I’ve had in North America. And these oranges were winter oranges; in the summer they are even sweeter! 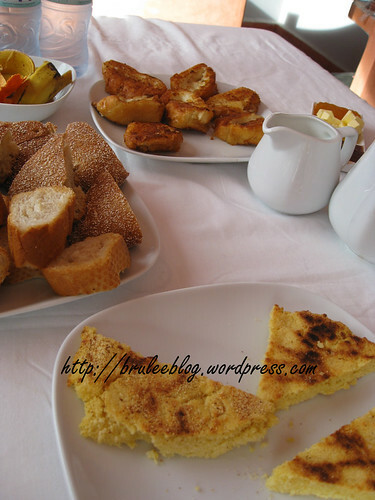 The breakfast we had before we left Marrakech consisted of French toast made from baguettes (top), more khobz bread, and semolina bread (named harsha in Arabic). And more fruit. I gobbled the oranges. John, his wife Elizabeth, the riad’s manager Kamal, and all their staff went out of their way to make our stay a pleasant one. It was an auspicious (and delicious) start to the Morocco leg of our trip.